We know home dental care can be intimidating to many pet parents, but it is strongly recommended and can improve your pet's life immeasurably! The gold standard of dental care is toothbrushing with specialized enzymatic toothpaste. Studies have shown that brushing three times a week is adequate to maintain healthy teeth and gums but daily brushing is needed to control existing gingivitis. We offer several different palatable flavors of enzymatic toothpaste, poultry being the most popular. This toothpaste has a Dual-Enzyme System (glucose oxidase and lactoperoxidase) that provides natural antibacterial action and neutralizes mouth odors. 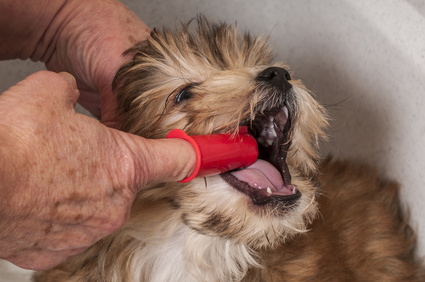 First, have your pet get used to the flavor and consistency of the toothpaste. Let him lick some off your finger. Praise your pet when he licks the paste and give a reward. If he does not like the taste of the toothpaste, you may need to try a different kind. Continue this step for a few days or until your pet looks forward to licking the paste. The next step is to have your pet become comfortable with having something placed against his teeth and gums. Apply a small amount of paste to your finger and gently rub it on one of the large canine teeth in the front of the mouth. These are the easiest teeth for you to get at and will give you some easier practice. Be sure to praise him and give a tasty treat or other special reward. Next, get your pet used to the toothbrush you will be using routinely. Let him lick the toothpaste off of the brush so he gets used to the texture. Again, praise your pet when he licks the paste and give a reward. Continue this step for about a week, making sure your pet readily licks the paste off of the brush. The last step is to start brushing. Talk to your pet in a happy voice during the process and praise him at the end. Lift the upper lip gently and place the brush at a 45° angle to the gum line. Gently move the brush back and forth. You do not need to brush the inside surface of the teeth. The movement of the tongue over the inside surfaces keeps them relatively free of plaque. Be sure to praise your pet, end on a good note and give a tasty treat or other great reward. 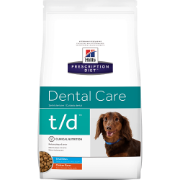 We recommend using Hill's t/d kibble as a treat daily to help reduce and keep your pet's teeth white and bright. This high fiber kibble is clinically proven to reduce plaque, stain, & tartar buildup by gently scrubbing the teeth as your buddy chews. Another good addition to your dental heath arsenal are dental wipes. These wipes contain acetic acid and sodium hexametaphosphate (HMP) which effectively brighten and whiten teeth. Both acetic acid and HMP are sequestering agents, which bind minerals effectively inhibiting the transformation (mineralization) of dental plaque into tartar. HMP also coats the teeth and prevents further plaque, calculus and tartar build-up. The flavor is pleasant cinnamon-clove, which is favored by dogs and deodorizes their breath. The clove has an age-old additive effect of relieving pain, thus soothing the gums. Just a swipe along the gum line in between brushings can make a big difference! 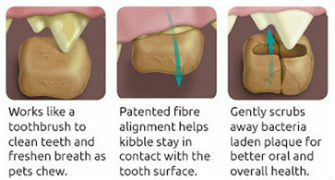 Another option for keeping those pearly whites healthy are dental chews. 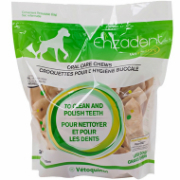 These highly digestible, rawhide-like chews contain chlorhexidine help remove plaque and reduce tartar. The antiseptic chlorhexidine system, combined with the natural abrasive cleansing action of the chews, helps to keep breath fresh and teeth clean. Great to give between brushings, or even if you're unable to brush with especially difficult (and squirmy!) pets!